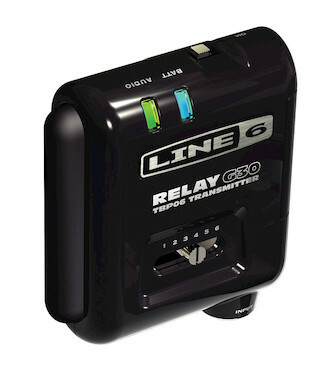 TBP06 wireless transmitter is designed for use with the Relay G30 Wireless Guitar System. Its brawny construction, low-profile design and simple operation help the award-winning Relay G30 Wireless Guitar System offer superior sound quality and dependability to guitarists and bassists. The tough, durable shell is constructed of rugged but lightweight polycarbonate. This protects the electronics without the transmitter dragging you down. Plus, the low-profile design isn't big and bulky like other transmitters, and it features internal antennas for the ultimate in comfort and convenience. At-a-glance recognition of power, signal status, battery life, and channel number is incredibly important during a performance and can be accessed via a pair of bright LEDs and a front-mounted channel-select switch. You'll never be left guessing how much juice you're got left. Refreshingly simple, TBP06 wireless transmitter features a standard 1/4-inch input. Plug your guitar right into it without the need for additional cables. TBP06 wireless transmitter helps Relay G30 Wireless Guitar System boast some of the best audio specs in the business (10Hz-20kHz frequency response, 118 dB dynamic range, and 24-bit A/D conversion) for superior sound of the highest definition.